With the free car the beaches, cafes, hotels, vineyards, golf course etc are only minutes away. For those interested in the outdoors there are walking tracks that start right at our back door that will take you to the nearest beach and/or into the native forest and swimming holes. This Whakanewha Park experience is not to be missed. See picture. All Linen and Towels supplied except beach towels. All cooking facilities are in the unit with cook top stove and oven. Fridge and microwave also included. Our Loan Vehicle Disclaimer - Important to read this carefully. The loan vehicles are free to use if you have a full drivers license, have experience driving on the left side of the road and prepared to replace fuel used. We want to make you aware that they are UNINSURED. It's not a legal requirement to insure a vehicle in NZ and if we acquired the necessary documentation and certification checks/labels to insure the vehicles we would have to apply a rental charge to help out with the cost. NO RESPONSIBILITY for your safety or injury will be taken by the vehicle owners and you will drive our loan car at your own risk. Our loan cars are kept up to NZ road-worthy standards and have all the necessary legal requirements (Warrant of fitness and Registration) as well as frequent service checks. We've had not had an incident or accident by any of our guests since we started in this business 16 years ago but if it were to happen we would cover any damage to our vehicle but once again NOT take responsibility for your safety or injury so you are driving our vehicle at your own risk. If you are from another country that drives on the right side of the road and if you cannot demonstrate that you are familiar with driving on the left side of the road you could be refused use of a car. We give and insist at times on a supervisor drive if you are not used to driving on the left side of the road. Cliff will sit in the passenger seat and observe your driving skills and offer any helpful advise on how to stay safe on Waiheke Island roads. This will last for approximately 30-60 minutes. If Cliff decides that you do not have the skills to drive safely and pose a danger to other road users then you will be forbidden the use of the vehicle. If this circumstance were to arise you will be given the contact details of the cheapest taxi company and we will help out where we can. Example: to drop you off at a vineyard or to go shopping. 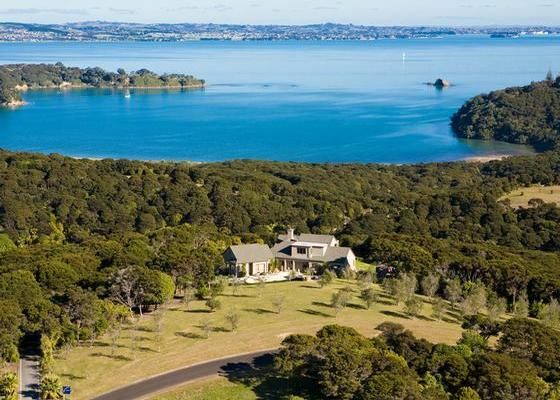 Waiheke Island is larger than most people think and we consider a car essential if you want to take in all the glorious beaches, vineyards, cafes and restaurants. Myself and wife Gaye have owned and operated our Villa Pacifica accommodation for 17 years. Cliff has lived on the island for most of his life and Gaye was born on Waiheke. So I guess that makes her a 'Waihetian' ha ha. You're in good hands with local people who know the island very well. We are situated in an absolutely pristine and peaceful neighborhood. The only sound you will hear is the wind and bird life making it an ideal environment for rest and relaxation. Yet by making use of our free car guests can easily access in a few minutes the local shopping, vineyards, cafes, restaurants, activities, beaches and the walking tracks start right at our back door Getting around: Free use of a car available with every booking with a full drivers license. Taxis can easily be contacted and available or bus route not too far away. Relax on a paved balcony on top of a hill overlooking the ocean. Use of a BBQ if required. Wireless internet also available and is free to use Guest access Our entire 18 acres with lots of walking tracks down to the sea Guest interaction: The owners are available to help at any time. You are on your own until you request something. We both like to travel. Our favorite holiday destination would be the Amalfi Coast area of Italy. Free use of a car included with full drivers license and transfers from/back to the Waiheke wharf up to and including the 5pm sailing. Free wifi available. Cafes, Vineyards & Restaurants only minutes drive away or walk to Batch winery. Beautiful spot. Pleasant, clean house with all the modcons. Friendly, knowledgeable host. I loved Villa Pacifica! The views of Hauraki Gulf were stunning. Cliff was a friendly,knowledgeable host, and the vehicle that came with the house was a big plus for exploring Waiheke Island. I’ll stay longer next time! Location is tranquil and quiet with a loverly view to the harbour. Location is tranquil and quiet with a loverly view to the harbour. About 5min by car to the village 10 to 15min to the main shopping/Cafe area. Villa is comfortable and clean. We had a very nice stay. We enjoyed relaxing in the quiet with the lovely view.